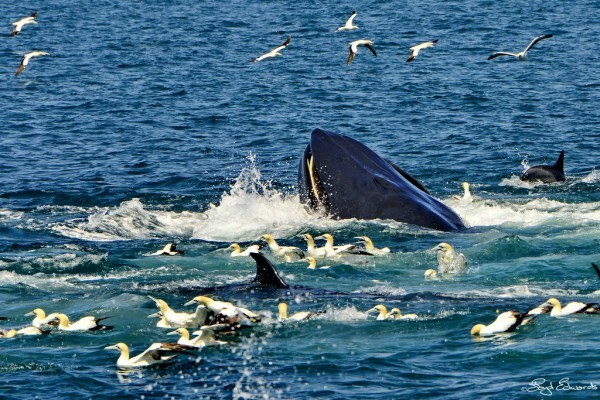 Whales and dolphins are getting ready to feast on sardines ahead of the annual and eagerly awaited Sardine Run on the KZN South Coast. Excitement is all round with sardines having been spotted at various sites around the Eastern Cape as they make their way up to the KZN South Coast. In the meantime, big shoals of baitfish off Southbroom and Port Edward have given the predators a chance to rehearse for the ultimate Sardine Run. The Sardine Run is a natural phenomenon when millions of sardines travel in giant shoals offering pelagic predators along the way a tasty feast. 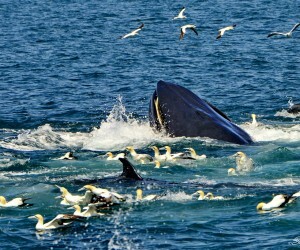 The bait balls are often driven close to the shores to the delight of Cape Gannets, onlookers and fishing charters, who race out and bring in their catch for everyone to enjoy. Seen from the shores, this creates a spectacular frenzy of activity with nets and bucket loads of silvery fish everywhere. The Sardine Run off the KZN South Coast is one of South Africa’s bucket list items for local and international travellers, who try time their arrival with that of the sardines. The sardines generally arrive anytime from May to August, but all indicators are that they will arrive early this year, possibly between June and July, perfect timing for the school holidays. According to the KwaZulu-Natal Sharks Board “numerous shoals of various species of bait fish can be seen off the KZN coast on a daily basis, especially during calm sea conditions. The first positive signs of heavy predator activity was seen just south of Mazeppa Point on the Eastern Cape Coast. This area is still some 200km south of KwaZulu-Natal and it may well be some time before they eventually reach KwaZulu-Natal. This however does not exclude the possibility of some small shoals of sardines currently occurring off the KZN coast.” Mike Anderson-Reade, Head of Operations added that shark safety gear remains in place at all protected beaches along the way. To keep everyone entertained during this time, the KZN South Coast puts on a diverse and comprehensive events calendar. A Sardine Beach Festival held at various beaches include beach sports from volleyball to touch rugby, competitions and giveaways. Major events not to miss include the South Coast Lions Show, the Umtamvuna Sardine Festival, the South Coast Fever MTB Series, the Mercury Ski Boat Festival, the Annual Sardine Run Golf Tournament, the Ugu Jazz and Arts Festival and the Ramsgate Book & Art Festival. And for a cultural experience, don’t miss the Maidens Ceremony and the newly launched Great Drives Out – 4 authentic culture & heritage experiences in the hinterland that showcases attractions such as rock art, waterfalls, holy mountains, sangomas and the traditional homestead of local reality TV superstars, the polygamist Mseleku family, all within scenic surroundings.